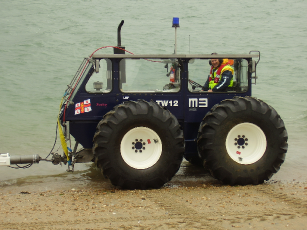 The MB-764 County tractor is used for launching of the Atlantic 85 lifeboat and is one of three types of marinised tractors used by the RNLI. It can wade to a depth of 1.5 metres in calm water. 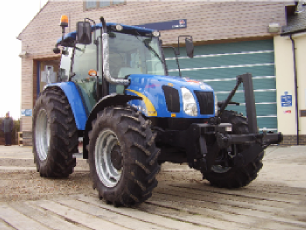 The tractor is waterproof up to the height of the roof, where it is open for access to the engine and driving position. The wheels are three quarters filled with salt water. This acts as ballast for the tractor to make it heavy enough to stop the tractor floating when trying to launch. However when the water level reaches half way up the windows it will start to float. The Lifeboat DoDo is connected to the tractor at the front by a Nato hitch. Using this hitch means that if it is necessary the tractor driver can pull a lever detaching the DoDo rig from the tractor. This is normally only used if the tractor becomes bogged down. (Click here for more information on bogging down). As pictured above we have a grading blade that attaches to the front actuator, this is so we can grade the beach after rough weather. Awaiting picture.